A recent survey revealed that 95 percent of people have a negative perception of a retail store if they encounter a dirty restroom. A clean restroom can leave a lasting impression and encourage repeat business. 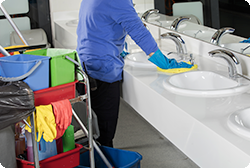 Train your employees how to thoroughly clean and freshen up your restroom. This computer-based training module offers instruction for step-by-step cleaning of the restroom area, employees are instructed on the proper way to clean ceilings, stalls, walls, mirrors, fixtures and floors. Employees will understand the importance of regularly checking the restrooms for cleanliness, and replenishment of items such as toilet paper, soap and paper towels.